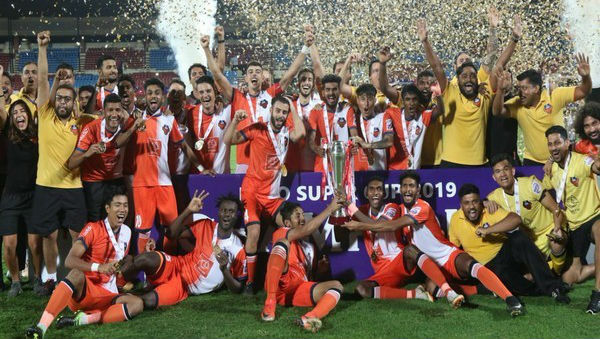 Bhubaneswar (Odisha), April 14: FC Goa on Saturday clinched the Super Cup 2019 title as they defeated Chennaiyin FC 2-1 in a thrilling match at Kalinga Stadium in Bhubaneswar. Goa were the firm favourites going into the match, but it was Chennaiyin, who started the game as the better of the two sides. Chennaiyin continued to apply pressure on the Goa defence. In the opening first half, they created three consecutive chances in a space of three minutes, but they were not able to convert them into goals to take an early lead in the match. Hero Super Cup 2019 Final Preview: FC Goa, Chennaiyin FC Face Off in Summit Clash at Kalinga Stadium . Goa slowly but steadily started to gain a foothold in the match and they could have scored themselves, but it was Jackichand Singh who let the team down as he was not to able to apply the finishing touches to score the much-needed goal. The first half remained goalless, but the complexion of the match changed drastically in the second half. Both teams decided to come out on the field with more intensity. Goa drew the first blood in the match as Ferran Corominas scored for the team to take the team 1-0 ahead in the 51st minute of the match. Chennaiyin's Thapa cheaply gave the ball away near the halfway line, Hugo Boumous drove towards Chenaiyin's goal, before forcing the goal-keeper Karanjit Singh to make a save. However, the rebound fell perfectly to the Spaniard, who had the simple task of tapping the ball home.FC Goa were not able to maintain their lead for long as Chennaiyin came back strongly with the equaliser in the 54th minute. Raphael Augusto scored for the team as he pounced on a loose ball just outside the box, firing a shot which took a massive deflection to deceive goal-keeper Mohammad Nawaz. The match was levelled at 1-1 but it was Goa who were able to find their mojo yet again as Brandon Fernandes scored for the team in the 64th minute to give the team 2-1 lead. After the second goal, Goa were able to hang on to ensure that they lift the Super Cup trophy. With this win, FC Goa won their first ever Super Cup title. Goa Overcome Chennaiyin 2-1 to Clinch Hero Super Cup Title.